So looking forward to teaching at this year's Shake Rag Alley Writer's retreat on April 25-28, 2019. If you want to study under award-winning writers, this is the retreat for you – and it's incredibly affordable to boot! Here's the LINK for more information. I'm fortunate to be teaching and presenting and talking about writing with a boatload of talented writers at Northwestern University Summer Writers' Conference, August 9-11. HERE's the link and early registration rates are good through July 8. Faculty and readers include Amin Ahmad, Anne-Marie Akin, Ignatius Valentine Aloysius, Gint Aras, Martha Bayne, Ian Belknap, Joshua Bohnsack, Gerald Brennan, Susanna Calkins, Henry Carrigan, Shannon Cason, Sarah Connell, Amy Danzer, Kevin Davis, J-L Deher-Lesaint, Paul Durica, Robert K. Elder, Eileen Favorite, Charles Finch, Beth Finke, Vincent Francone, Amina Gautier, Goldie Goldbloom, Adrienne Gunn, Betsy Finesilver Haberl, Miles Harvey, Julianne Hill, Jonathan Winston Jones, Laura Jones Riva Lehrer, Mike Levine, Billy Lombardo, Rebecca Makkai, Juan Martinez, Eric Charles May, Marty McConnell, Adam Morgan, Simone Muench, Jarrett Neal, Toni Nealie, Jeremy Owens, Christine Pacyk, Marcy Posner, Ruben Quesada, Roger Reeves, Ross Ritchell, Kenyatta Rogers, Kathleen Rooney, Renée Rosen, Abby Saul, Karen Schreck, Donna Seaman, Fred Shafer, Virginia Smith Rice, Christine Sneed, Mare Swallow, Rachel Swearingen, Ben Tanzer, Frank Tempone, Vu Tran, Emily Victorson, Michele Weldon, Jeremy T. Wilson, Mary Wisniewski, and Zoe Zolbrod. Tune in to WCGO 1590 on Sunday, July 1, 1 pm, to hear what's going on with Hypertext Magazine & Studio (& follow their FB page because they support Chicago arts). HYPERTEXT REVIEW SPRING EDITION HAS HATCHED! FRIENDS OF HYPERTEXT! So many of you lovelies have contributed your gorgeous stories, essays, and poetry to Hypertext online or to our print journal –– and we adore you. As you probably know, we've become a real, live nonprofit "dedicated to teaching writing and storytelling techniques to communities directly impacted by violence, people who are rebuilding their lives after being incarcerated, recovering from substance use disorders, or any underserved community whose collective voice has been marginalized in any way." Our other initiatives include publishing established and up-and-coming writers – online and in print – AND paying our print journal contributors. We need your help. We're having two print journal book launches SLASH fundraisers: May 4, 7 pm, The Book Cellar AND May 20, 2 pm, The Book Stall (Winnetka). Book Cellar readers include: Christine Sneed, Cyn Vargas, Natasha Mijares, Toni Nealie, Desiree Cooper, Re'Lynn Hansen, Scott Atkinson, & Gint Aras. Book Stall readers include: Eileen Favorite, Gail Wallace Bozzano, Doro Boehme, Peter Ferry, Garnett Cohen, Kathleen Quigley, & Garin Cycholl. No contribution is too small and, as you know, we've been operating on a shoestring since 2010 so we know how to make a dollar sing. You can find out more and donate HERE. If you need to get away to write for the weekend, look no further than the Shake Rag Alley Writers Retreat in Mineral Point, Wisconsin. This is the second annual retreat (April 27-29) and, if it's anything like the first retreat, you'll meet a great group of like-minded writers. In addition to exploring your writing, you'll also be able to discover the charms of Mineral Point, Wisconsin. I'm delighted to be participating in two CWA Writers Conference 2018 events on February 10 and March 10-11. For those of you who were at the pre-conference event on February 10, I will post a link to the presentation on Monday, February 12. The CWA Conference will be held March 10-11. I'll be waxing eloquent (hopefully) on "The Tao of the Classic Short Story: KIckin' It Old School...Sort Of." Learn more about this event HERE. There were the Three Tenors and now, for the first time together, I'm introducing the Fearless Quartet (I know...not as catchy). Regardless, on February 21, I'll be reading with Cyn Vargas, Sahar Mustafah, and Patricia Ann McNair at one of Chicago's best independent book stores: The Book Cellar. Find out more HERE. I'm excited to help Barrie Jean Borich celebrate the publication of her latest book along with local authors Juan Martinez (Best Worst American: Stories), Tara Betts (Break the Habit), & T Clutch Fleischmann (SYZZGY, BEAUTY: AN ESSAY) at another of Chicago's independent institutions: Women & Children First. Find out more HERE. My short story “Ballast” appears in Rust Belt Chicago: An Anthology, edited by Martha Bayne. Cover art by Chicago-based artist Tony Fitzpatrick. 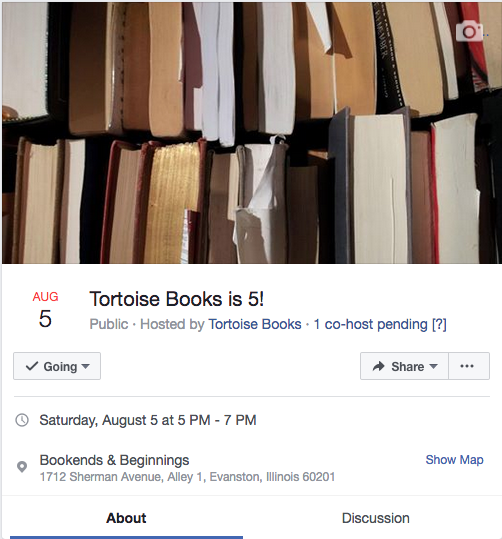 I'm excited to eat birthday cake and honored to read as part of Tortoise Books 5-year Anniversary Reading. Come join us on August 5, 2017! I am exceedingly delighted to be part of the first annual Flint Literary Festival being held July 21 & 22, 2017! Here's the LINK to EAST VILLAGE MAGAZINE for more information (I've also pasted the article below). The inaugural Flint Literary Festival will be July 21-22 and feature several noted authors with Flint roots who have achieved critical and commercial success with their writing. Hosted at the Flint Public Library, the literary festival will also include panel discussions, a reading room, a book fair, and an After-Hours Open Mic Night at a local establishment. This free event – a partnership between Gothic Funk Press, the Flint Public Library and East Village Magazine – was created with the goal of lifting together the literary communities of Flint. “Flint Literary Festival 2017 will promote literature in all its forms, from poetry to fiction to creative nonfiction,” said Connor Coyne, director of Gothic Funk Press. “We hope to inspire and propel our talented local writers to new heights. The featured readers for this year’s event are: Newberry Medal and Coretta Scott King award-winning author Christopher Paul Curtis, award-winning novelist Christine Maul Rice, acclaimed poet Sarah Carson, and Hub City writer-in-residence Kelsey Ronan. The writers, who all have deep ties to Flint, will read selections of their work followed by short discussions about the literary craft. The festival will also feature a designated reading room where writers can reserve a half-hour slot to read their work aloud. Guest readers will have the opportunity to sell their books at these readings. The panel discussions are still being finalized but will cover topics of local and universal literary interest. Meanwhile, the book fair will run from 1-5 p.m. July 22, and feature local and regional book organizations and writers. Books will be available for purchase at this event. On July 21, the festival is sponsoring After-Hours Open Mic Night at the Golden Leaf Club, 1522 Harrison St. in Flint. Open Mic begins at 8 p.m., with a cash bar and live music provided. There is no cover charge and the public is invited. For information on reserving a guest-reader spot or space at the book fair, please visit FlintLiteraryFestival.org. The website will also include information about the specific panels and invited guests. More information is available from Connor Coyne, 708-224-5297, email blueskiesfalling@gmail.com. Join me at the Crystal Lake Public Library on June 20 for a reading and Q&A. Seven o'clock pm, Crystal Lake Public Library, 126 W. Paddock Street, Crystal Lake, IL. 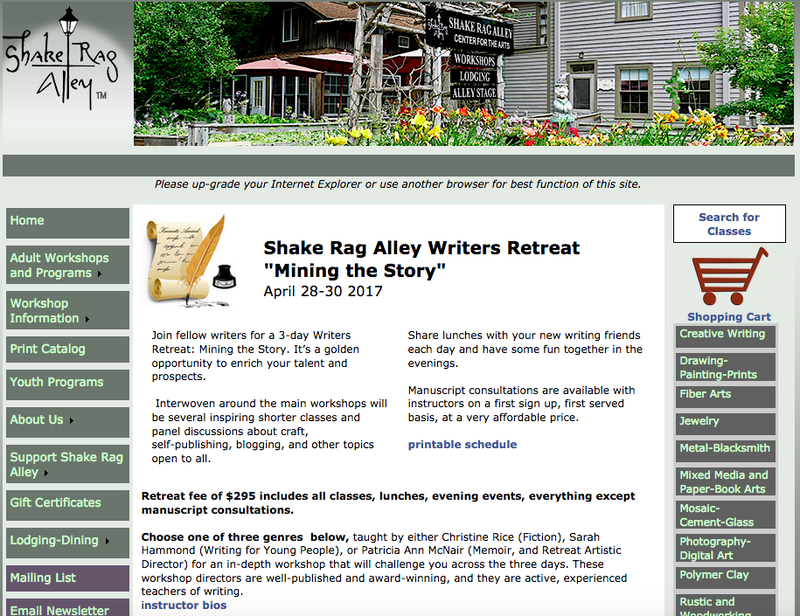 So looking forward to teaching at this year's Shake Rag Alley Writer's retreat on April 28-30. If you want to study under award-winning writers, this is the retreat for you – and it's incredibly affordable to boot! Here's the link for more information. I'm psyched to be part of Columbia College Chicago Creative Writing Reading Series AND to be reading with HEY, LIBERAL! author Shawn Shiflett. The event is Thursday, March 2, 5:30. Looking forward to my conversation with Claudia Casper at Women & Children First on November 16. 'Parenting done. Write.' I'll be reading December 13, 2016 at the Pen Parentis reading series in NYC. Can't wait. 75 Wall Street, second floor, New York, NY 10005. I'll be Chicago Writers Conference panelist with Lorraine Boissoneault (The Last Voyageurs), Leslie Parry (Church of Marvels), and Nadine Kenney Johnstone (Of This Much I'm Sure, forthcoming April 2017) on September 24, 2016. I'll be celebrating Shawn Shiflett's upcoming release of HEY, LIBERAL! at The Book Stall on Saturday, September 10! I'll be participating in the Live Lit Crawl on August 18 in Andersonville. Honored to be a panelist at the first annual Chi Teen Lit Fest with Eric May, Billy Lombardo, Kathleen Rooney, and Tiffany Gholar. MICHIGAN FAMILY AND FRIENDS! JOIN ME AT THE LINDEN PUBLIC LIBRARY ON MAY 18 FOR A READING AND BOOK SIGNING!